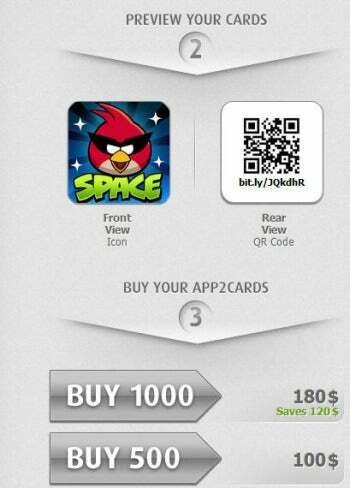 App2Card is a service aimed mainly at mobile app developers. It invites them to reimagine their app icon as a physical object and use it to drive more traffic to their app online. In other words, apps have not killed business cards…they're helping to make them. App2Card charges $30 for 100 cards. App2Card makes it very easy to pull in your app's information. Much work goes into designing an icon for a smartphone app, and done right, it becomes the app's "face," instantly recognizable to users and fans. App2Card lets you take all that work and leverage it into the physical world. To use it, simply enter an app's name, and App2Cards will search for it on iTunes and Google Play. Once you find your app in the list, click it. You will instantly see a preview of your app's App2Card: The front has a full-size image of your icon, while the back features a QR code that leads users directly to your iTunes or Google Play URL. That's it: You can now order physical cards to promote your app. 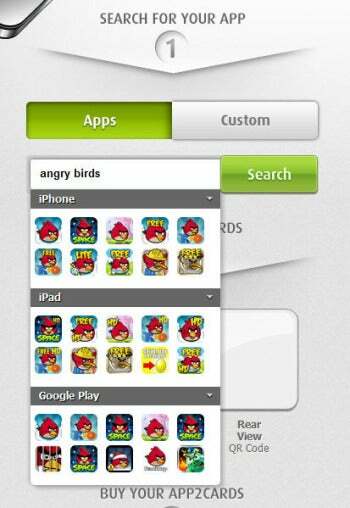 Since anyone could potentially order cards for any app, vendor AptGeek Technologies takes the time to filter orders manually, keeping an eye out for suspicious-looking orders, such as an Angry Birds icon with a QR code leading somewhere else. Although it's optimized for mobile app developers, App2Card can also be used to create custom business cards. You can upload an image for the card's front side, and specify a URL for the QR code and some text for the card's back. This works nicely if you have a compelling personal website on a service such as Flavors.me or About.me. App2Card cards are made out of solid, shiny plastic similar to that used for magnetic membership cards. The cards are made of card stock, but are laminated with a thick layer of glossy plastic, making them seem like magnetic membership cards. They are slightly thinner than a credit card, and much smaller. They are pricier than the popular MOO MiniCards, too: 100 App2Cards cost $30, while 100 MOO MiniCards cost $20. Then again, the narrow, elongated MiniCards don't look like square plastic icons. App2Card cards are nothing if not distinctive. App2Card focuses on a seemingly narrow niche, but it makes sense: Mobile app markets are exploding these days, and developers are looking for interesting ways to capture attention. A custom plastic credit card with your app's icon will certainly do that--as will one with your Twitter avatar and personal website URL. Note: The Download button takes you to the vendor's site, where you can use this Web-based software to design and order cards. Quick and simple service App2Card lets app developers and individuals produce unique business cards.